n Saturday, September 7th, Legislator Sarah Anker joined the local community atthe 4thAnnual Port Jefferson Village Cup Regatta. Port Jefferson, NY - September 2013 - On Saturday, September 7th, Legislator Sarah Anker joined the local community atthe 4thAnnual Port Jefferson Village Cup Regatta. Co-hosted by the Setauket Yacht Club and the Village of Port Jefferson, the event raised awareness for pancreatic cancer treatment and research, with proceeds benefiting the Lustgarten Foundation and the Palliative Medicine Program at John T. Mather Memorial Hospital. The Palliative Medicine Program helps patients and their families manage life changing and chronic illnesses, including pancreatic cancer. The goal of palliative medicine is to prevent and relieve suffering and provide the best quality of life for people living with the pain, complex symptoms and stresses of chronic illness. The regatta highlighted a friendly rivalry between sailing teams from the Port Jefferson Village and John T. Mather Memorial Hospital in a race for a cause, with the victory going to the Village. This year’s Regatta Ambassador was local resident and actor, Ralph Macchio who starred in films includingThe Karate Kid and The Outsiders, and continues to be a strong advocate for cancer research and awareness. For more information, visit their website. Pictured: Legislator Anker joins Regatta Ambassador Ralph Macchio and his wife Phyllis, and Regatta board members in supporting pancreatic cancer research. 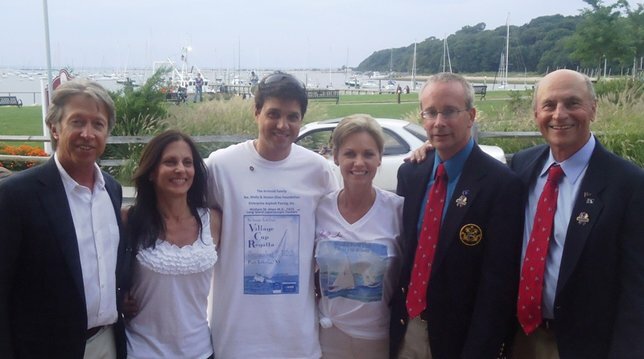 From left to right, Gary Passavia, President of the Setauket Yacht Club Foundation, Phyllis Macchio, NP, from Mather Hospital, Ralph Macchio, Legislator Sarah Anker, Karl Janhsen, Commodore, SYC, CharlesChiaramonte, Chairman, SYC Village Cup Regatta. Subject: LongIsland.com - Your Name sent you Article details of "Legislator Anker Supports Pancreatic Cancer Research & Palliative Medicine"